This book is one of the most interesting you will read about marketing. 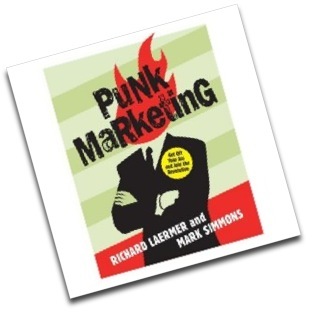 Punk Marketing by Richard Laermer and Mark Simmons. From the very beginning they begin to make statements that you thought about but were too kind to say. Advertising agencies being ‘brand guardians’. Now there is a concept that needs no explanation. They discuss that TV is not the end all it once was. And that the shift in power to consumers (internet, blogs, wikis) is here and we had better take notice (those of us that are selling in the marketplace). For example Daren Barefoot’s blog on Vancity has now moved into another realm, opensourcecu.com. And where are they? A small company in Piano, Texas just north of Dallas. That is what is happening and it is happening now. They go into pretty much the state of advertising as we are seeing it. There is very little historical information as they put what happened yesterday in context of why it doesn’t really work today. One of the best lines was on page 179 when it was talking about spending ‘Punk Marketers know that not having as much money means you think more than you spend‘. I picked it up at the airport and quickly finnished it. Now it is in the mail to our ad agency Currency. I am waiting for a long lunch discussion! You just sold another book for Laermer and Simmons. Thanks for the shoutout. We actually just moved our company to Indianapolis because we met Doug True (a CU exec and CUSO CEO) on his blog. Relationship grew, he joined the board of our company, and our companies began working together. Next thing you know it, we move to Indy (three weeks ago now). Thanks for pointing out that I needed to change that page on the site. And great post, BTW.